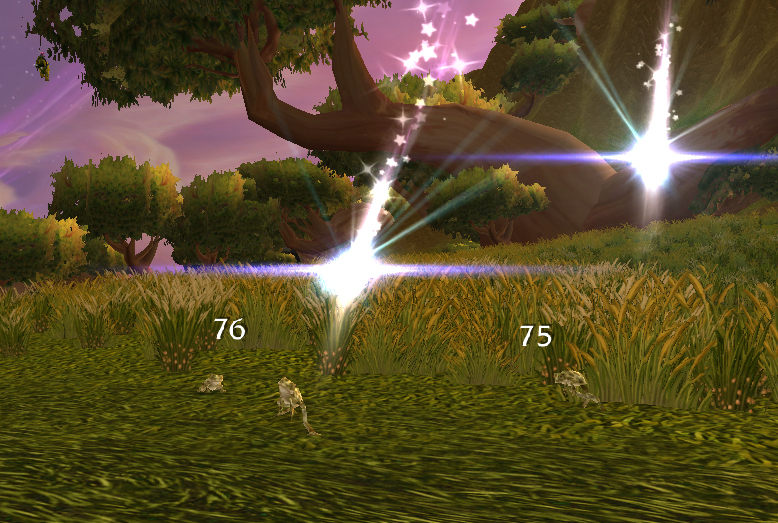 As you collect more & more battle pets, at specific benchmarks, you’ll get an achievement and a new pet. The first one is the Reeking Pet Carrier at 50 unique pets. This counts, for example, a brown snake and a black snake as 2 different pets even though they’re not exactly special little snowflakes. Who are you trying to fool, snakes? Up until 150 pets and the Littlest Pet Shop achievement, they’re all pretty much duplicates of other pets you can tame or purchase. 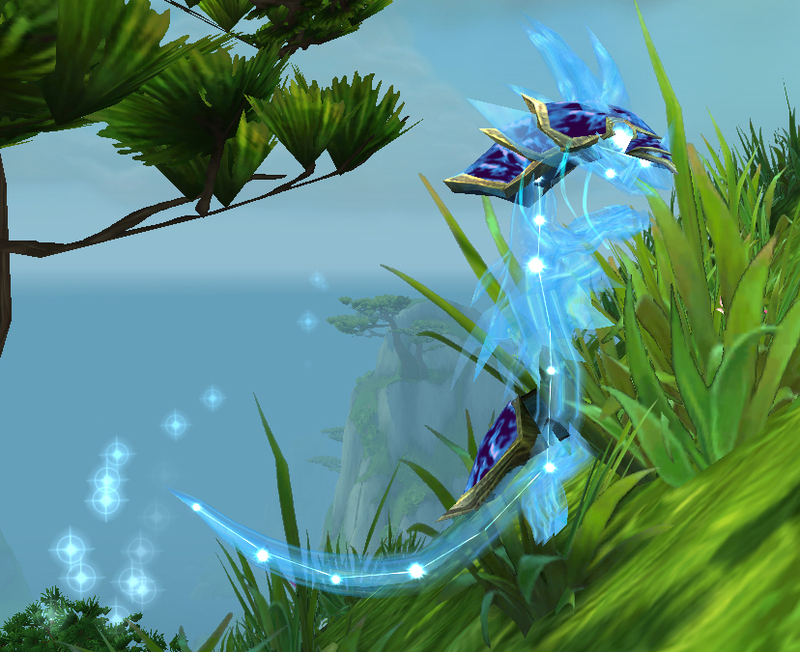 With that milestone, the Celestial Dragon awarded has both a model vastly unique from any other battle pet in the game and a few unique moves as well. The unique move is, well. Starfall is similar in nature to Moon Moon’s moon tears, and packs a lot of really cool graphic punch (see above), but as both offense and heal, it just isn’t all that effective, even on 2nd go-around after it’s buffed by its own Moonlight effect. It’s also on a fairly long timer, making it kind of a poor choice unless you’re just grinding wild battles and want to see some stars. She’s been the recipient of a few nerfs over time. She used to have the much stronger Dragonkin ability Breath instead of the current Elemental Burn in the first slot. Combining this with a strong heal in Ancient Blessing made even stronger with Moonlight in the third slot made for one of my go-to battling grinders. The overall effect was close to a current Spawn of Onyxia with more staying power. But now, she’s not really a first choice. Rounding out her moveset is the offense dampener Roar (though for me this is a poor choice because it deals little damage and that first slot is most of her offense) and the completely bafflingly placed Arcane Storm, which isn’t really a popular choice to begin with. By now, most WoW players are aware that our favorite scapegoat Greg Street has moved on to Riot Games. As a result, many players were in a tailspin for a while there. Who is going to be at fault for every little aspect of the game that goes awry? Enter Celestalon. 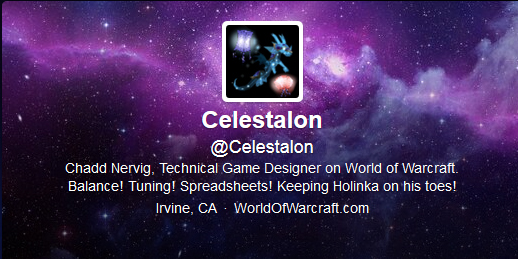 Celestalon’s official title is Technical Games Designer. Though Celestalon’s level of snark isn’t quite what Mr. Street once used, a hashtag (#blamecelestalon) has been circulating, used in the vein of #thanksobama, to blame Celestalon for things that couldn’t possibly have been his fault. So, I’d encourage those of you battlers to #blamecelestalon for the nerf to the Fluxfire Feline, just to make him feel at home. Or um, because this is supposed to be trying to butter up devs for upcoming information, that’s probably not such a hot idea. Maybe you should just #leavecelestalonalone? I’m kind of bad at this. (You can follow him on twitter @celestalon). This entry was posted in pet profile and tagged achievement, dragonkin, pet profile, sucking up, untradeable on January 26, 2014 by Liopleurodon. Stella is a great name! I named mine Sagan. Thanks! Yours is billions (and billions) more creative though. For me the biggest issue is that they swapped from the dragon nuke to an ele one. If they just kept it dragon and swapped to a burn-style mechanic it would’ve been fine, but there are just too many critters out there. I use her occasionally, mostly for nostalgia and the model is really unique and fun. 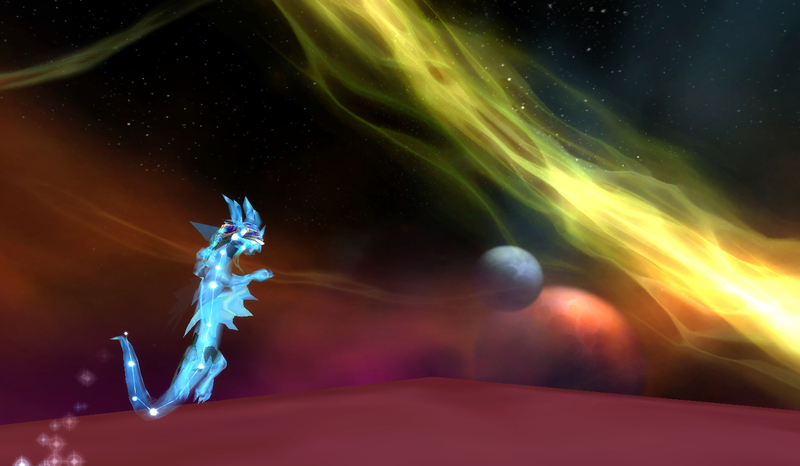 I still use my Celestial Dragon vs the Whispering Spirit. Between him and Chromius I can get a carry pet ~5k xp. I used to use her for this, but they swapped to the elemental burn before they swapped the first moth from critter to flying, so it… did not go well. lol. The thing is, nearly any combo of dragons works for that fight, because all the damage dealt is Flying. She’s alright, and she certainly has a lot of visual flair, but she isn’t a favorite anymore.